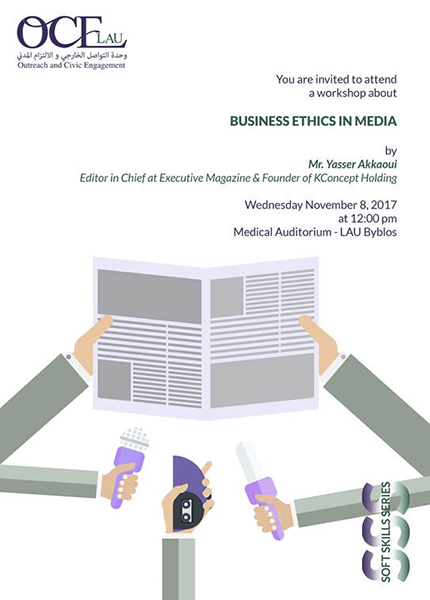 Yasser Akkaoui is the Editor in Chief at Executive Magazine & the founder of KConcept Holding, the mother company of Capital Concept sal, Prime Job, News Media and the Center for Strategic Studies. In addition, and among his many achievements and important roles, Akkaoui has been the chairman of the Lebanese Center for Policy Studies (LCPS) since 2011, the most respected think tank in the Middle East. In April 2010, he was invited to Washington by U.S. president Barack Obama, along with delegates from around the world invested in advancing entrepreneurship, to discuss the state of entrepreneurship in the Middle East and North Africa. Akkaoui is also the Vice Chairman of Young Arab Leader, and is also a member of the advisory board at the Adnan Kassar School of Business at LAU. Transportation from the LAU Beirut lower gate will be provided at 10:00 a.m. Return will be from the LAU Byblos lower gate at 1:30 p.m.
To attend, kindly register here preferably before the 6th of November 2017.